Gaming headsets combine the best of both worlds. A pair of headphones to offer immersive sound while gaming along with a microphone to let you communicate with teammates, friends, or even followers. However, many headsets are expensive and finding a decent pair that won’t either leave you eating ramen for the rest of the month or require an ungodly amount of research can be hard. While they are few and far between, there are a handful of headphones that combine a reasonable price with respectable quality. We’ve rounded up five such headsets and included reviews of each to help you find the best budget gaming headset for your needs. And if you’ve got a little more money to spare, then check out our list of the best mid-tier headsets. Many of the budget-friendly headphones on the market today have a poor, flimsy feeling build quality, as one might expect from a more affordable product. Usually, the headband and frame of the headphones are made from plastic that feels almost brittle and will warp if you apply even a little force to it. This is not the case with the Razer Kraken Pro V2. While these are the most expensive headphones we’re going to look at today, they are still within the range of most people’s budget and are only a few dollars more than many of the other options we’ll be taking a look at. Well, that’s if you catch them at their current price, which is around $55. However, they are often discounted to this price, so if they’re not $55 when you are reading, then just keep an eye on them. The frame of this headset is made from durable, yet lightweight, bauxite aluminum. This lends the Kraken Pro a very premium feel that plastic or other materials really don’t have. Also, the harder metal frame causes less reverberation inside the headphones than other materials, like plastic, which helps in producing amazing sound. Razer has outfitted these headphones with massive 50mm drivers that are powered by neodymium magnets. This allows the Kraken Pros to produce an amazing range of sound with impressive clarity and power. The retractable mic is also impressively high fidelity for this price point. The major weak point of these headphones, however, is that the microphone is pretty sensitive, meaning it can often pick up erroneous noise in the room. If you’re looking to get the most bang for your buck, then the Logitech G430 is the best value gaming headset on our list. For the price you pay for these headphones you get several features usually only seen on high-end headsets. The audio quality is solid, but what really makes the sound immersive is the Dolby 7.1 surround sound. While gaming, having surround sound can make a huge difference in your awareness of where enemies are and where they’re headed. Surround sound is a major game changer, especially in games like Apex Legends or PUBG. On top of the immersive 7.1 surround sound, the G430 headset has a surprisingly good noise canceling microphone. This blocks out the ambient noise from the room and can even help reduce the noise from loud keyboards when gaming. This helps your teammates hear your voice more clearly without hearing unnecessary noise. Unfortunately, in order to make these headphones so affordable Logitech had to cut costs somewhere. These headphones aren’t super durable since they use a plastic frame, which makes it all the more odd that these are so heavy. Some cheap gaming headsets can be very uncomfortable, and can even make long gaming sessions nearly impossible. Even some higher-end headphones can be uncomfortable after a while due to their weight. 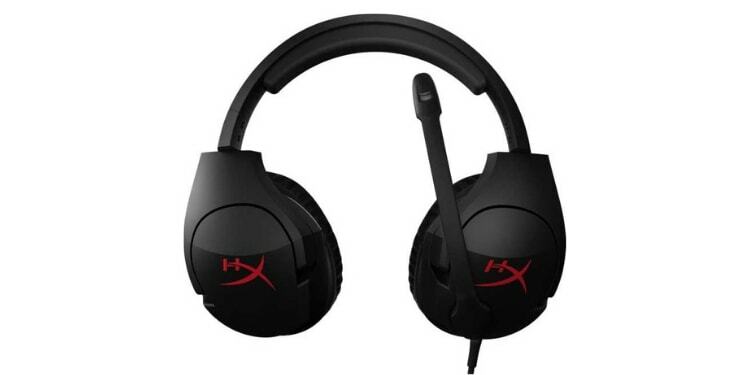 The HyperX Cloud Stinger headset weighs a mere 8 ounces. This is by far the lightest headset you’ll find on the market. 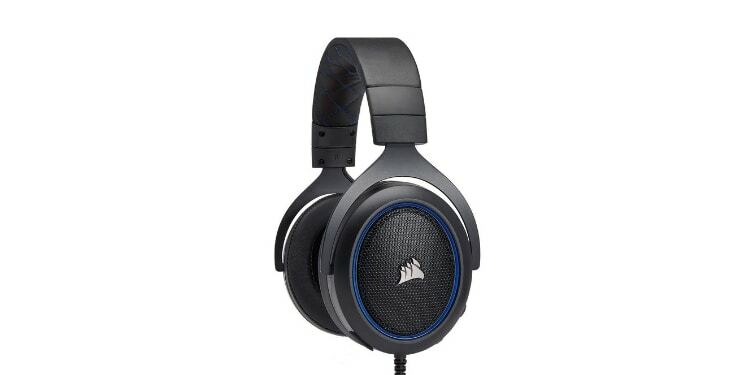 Despite this light weight, the headset has 50mm drivers that produce punchy bass and very solid sound quality. To up the comfort even further these headphones have memory foam padding in the ear cups. This soft padding is very comfortable and will last years without becoming flat and deflated like many other budget headsets. With the HyperX Cloud Stinger being so light and comfy, it is easily the best choice for those looking for a headset to wear during all-nighters. Unfortunately, this headset uses a different microphone from the other HyperX headsets on the market. Most HyperX headsets use a high-quality detachable mic, but these use a simple non-detachable microphone. While it is sound canceling and does a good job blocking out ambient noise, it is not very high fidelity and is not suitable for things like streaming. Whether you’re looking for a cheap headset to use while streaming, or just want to be clearly heard when on Discord with friends, the Corsair HS50 is probably the best PC gaming headset under $50 when it comes to microphone quality. This headset features a solid build quality with a metal frame and plastic trim that gives it a sleek look and premium feel. The sound is provided by 50mm drivers powered by neodymium magnets that let these headphones produce good sound quality, especially in the lower range. The microphone is detachable and makes these a versatile pick for gaming and use outside the house. Simply unplug the microphone and take them on the go as an unassuming pair of regular headphones. The microphone quality is very good and produces sharp and clear sound, but is very poor when it comes to sound isolation. In fact, we suggest picking up a microphone pop filter to help with this-- one of my friends used some of these in the past and they truly work-- since the HS50 does not come with one. What’s also nice is that several versions of this headset are available. If you are looking for surround sound, there is a USB version that boasts 7.1 surround and will run you about $5-$20 more depending on ever-shifting prices. There is also a wireless version, however, this one is significantly more costly (but still pretty good for the quality). Sound Blaster is a name that has been familiar to many gamers as far back as almost 30 years ago. Back in the early 90s, many computers had lackluster or even non-existent onboard audio. To help gamers get clear audio in their games, Creative started the Sound Blaster line of sound cards, a product that is practically non-existent in gaming computers today but was essential to a good setup in the past. Thanks to this, Creative has had literally decades of experience in producing quality gaming audio products, and it truly shows in the Blaze headset. This is the most affordable headset on our list, but certainly does not make it known. 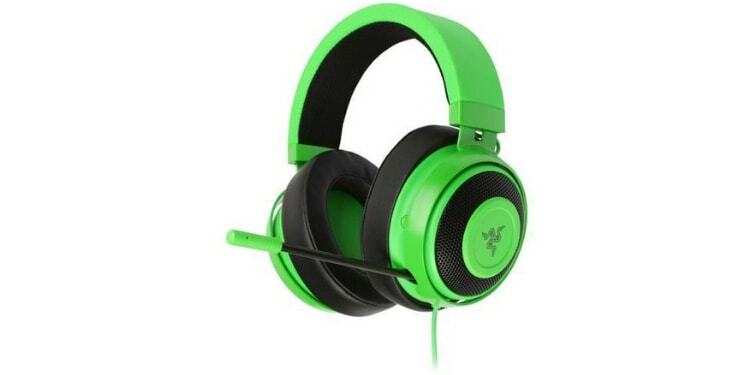 The audio quality is good and is suitable for gaming or music listening. The 40mm drivers do not produce as much of a punchy bass in the low end, but offer very sharp mids and highs. The microphone is also surprisingly clear and even has modest noise canceling capabilities. The mic is also detachable, much like the HS50, which makes these a versatile option for those who want one pair of headphones for gaming at home and listening to music on the go. Unlike the HS50 though, this detachable microphone comes with a pop filter out of the box (how novel!). These headphones also boast very soft padding on the headband and ear cups making them much more comfortable than you would expect for the price. While these may not be the best in any category, these headphones compare favorably to all of the other picks on this list and even take swings at headphones in higher price tiers. When it comes to picking the best pair of gaming headphones, there is usually no single best choice. Each headset on our list was chosen for a specific reason, and each one excels in a certain area. If you’ve never used a pair of headphones that have 7.1 or even 5.1 surround sound while gaming, then you likely don’t realize how much you are missing out. In games, surround sound gives you a level of awareness that players without surround sound will be completely lacking. This can make all the difference in many competitive games, especially first-person shooters. Pros in games like CS:GO and Quake use spatial sound cues to find enemies and react more quickly. 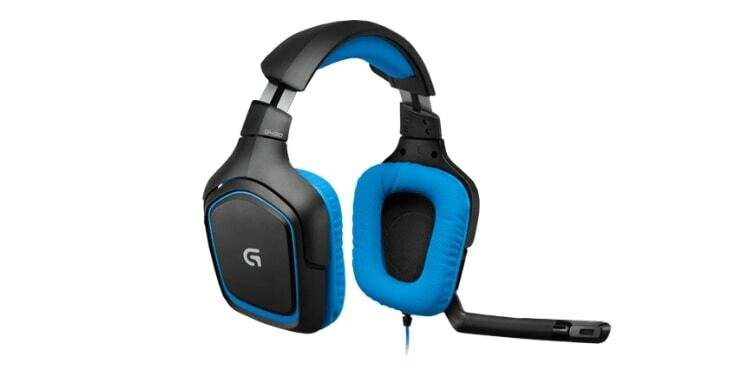 If you’re looking for an affordable headset that features surround sound, we recommend the Logitech G430. These headphones have Dolby 7.1 surround for an immersive gaming experience. Whether you want to simply be heard clearly by your teammates in game, or are trying to get started with streaming, there are plenty of reasons to be on the lookout for high-quality microphones. Unfortunately, headphones in this price range will never have an exceptional microphone, and even a relatively inexpensive stand-alone microphone like a Blue Snowball will produce much better sound. 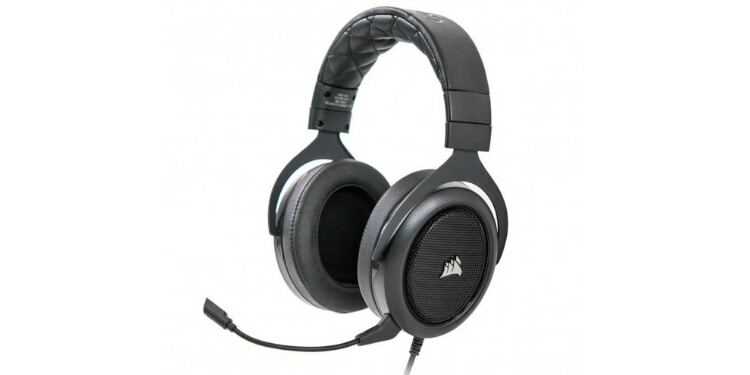 That being said, if you’re on the hunt for the best microphone on a budget headset, then look no further than the Corsair HS50. This headset has a shockingly high-quality detachable microphone for the price. That being said we suggest that you also pick up some pop filters, as the microphone is very sensitive and does not come with any kind of filter out of the box. When it comes to headphones, audio quality is actually pretty subjective. Every pair of headphones will have a different tuning and will be better or worse at certain tasks because of this. That being said some headphones have a wider frequency response, or range of sounds it can produce, than others. Also, some cheaper headphones will start to produce static or crackly noises at certain tones and volumes. If you’re looking for the highest fidelity sound in a budget-friendly pair of headphones, we recommend the Razer Kraken Pro V2. These headphones produce a near audiophile-grade sound that is not only great for gaming, but also offers an excellent music listening experience. Finally, many people will be on the hunt for the most comfortable pair of headphones they can find. If you’ve ever worn a pair of headphones for hours at a time during long gaming sessions, you’ll know that a lot of headphones that seem comfortable initially can become increasingly agitating over time. If you’ve ever experienced this and want a headset that will be comfortable for all night gaming sessions, then we suggest looking into the HyperX Cloud Stinger. This headset has very comfortable memory foam padding that is sure to stay nice and soft for years to come. On top of that, it is one of the lightest headsets on the market coming at a mere 8 ounces, which allows them to continue to be comfortable to wear even after hours of gameplay.